HOUSTON— If the third time's a charm, just call the fifth time magic! 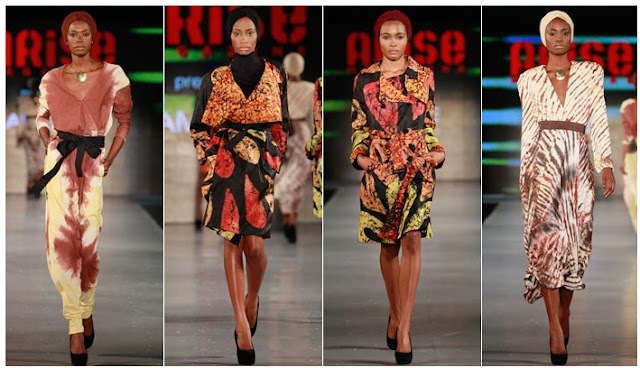 The world of fashion and culture will soon collide on the runway in Houston as African Fashion Week Houston, one of the world’s most exclusive cultural fashion week series, celebrates five years of showcasing the very best of African inspired works from around the world. The stunning fashion affair will take place October 22nd through October 27th, 2018 at various locations throughout the greater Houston area. Many of AFW Houston’s signature events, runway shows, beauty demos and marketplaces will make a grand return this year, including the socially savvy ​Art, Wine & Culture ​series​, the colorful and electric Ankara-4-Seasons ​runway showcase​, ​social media favorite Bosses-in-Heels ​Marketplace​, ​and the high-anticipated Kitoko Fashion Show​. A pairing of exciting performances, VIP events and after parties will also add to the flare of this very exhilarating week! A full list of events and locations will be announced beginning in mid April. Furthermore, AFW Houston will continue to support the advancement of aspiring fashion designers, stylist and runway production professionals through notable partnership programs, including ​Project AI(in partnership with the Art Institute of Houston). The fashion week series will utilize its platform to support the opportunity for future fashion industry protégés to gain direct experience into the world of the fashion. Tickets for African Fashion Week Houston 2018 will go on sale beginning April 1st online at www.AFWHouston.com and at selected locations across the state of Texas. AFW Houston is now accepting inquiries for event sponsors, fashion designers, vendors, volunteers and community partnerships. For information on this year’s fashion week series, please visit our website online, or contact us directly at ​1(800) 920-4655 and ​info@afwhouston.com​. African Fashion Week Houston (AFWH) ​is the city's premier international fashion experience, highlighting the essence of African culture and aesthetics through a series of fashion shows, networking and social events, seminars, and industry-focused workshops. Our annual week-long experience aims to promote world-class designers & labels that push the envelope, while staying true to the traditions and inspiration of the African continent and diaspora. Introducing Yemi Alade as the brand ambassador for Africa Fashion Week London 2016. She has become the platform's favorite because of her talent and creativity, and her unreserved African originality. 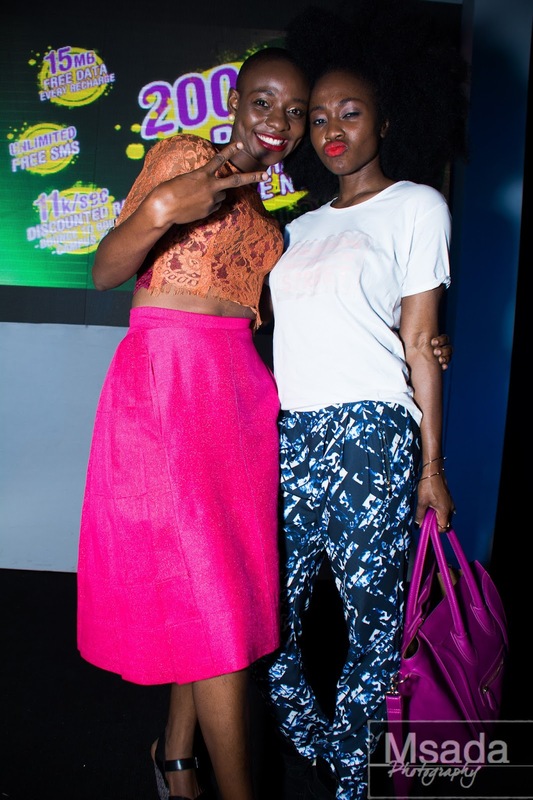 Yemi Alade represents everything that Africa Fashion Week stands for. She is someone who embodies the true African woman. She made her musical debut in 2005, but her music became widely popular after she won the Peak Talent Show in 2009. The songstress has performed around the world, sharing the stage and songs with Mary J Blige, Shina Peters, M.I, Wizkid, Becca, May D, Waje and Yemi Sax and you can meet her at Africa Fashion Week London 2016. Created by Ronke Ademiluyi, Africa Fashion Week London (AFWL) is Europe's largest catwalk event of African and African-inspired design. 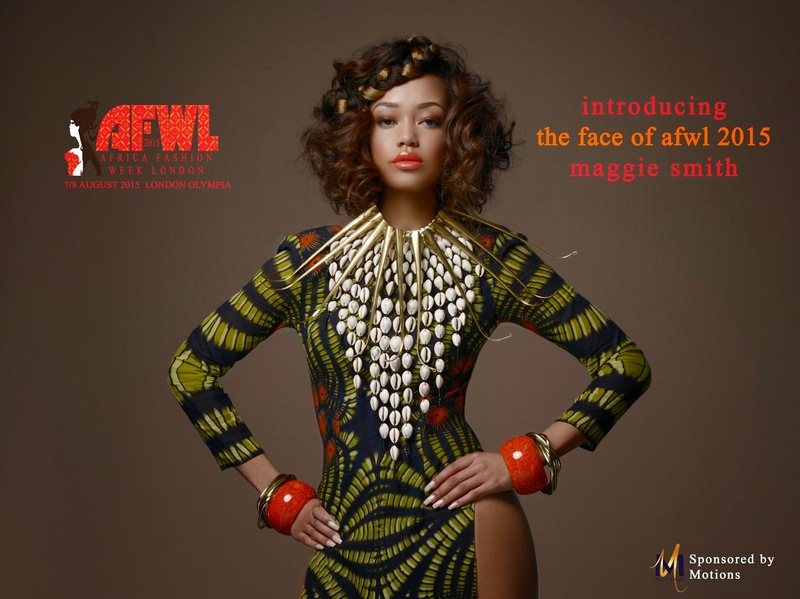 A collaborative catwalk and exhibition, highlighting the industry’s established and emerged African designers, AFWL is at the forefront of capturing the surge of the African inspired trends in the fashion industry. Our annual event aims to celebrate the work of African and African inspired designers in the UK and worldwide. 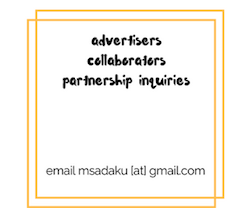 To increase the visibility and awareness of our designers by providing them with an affordable global showcasing platform. 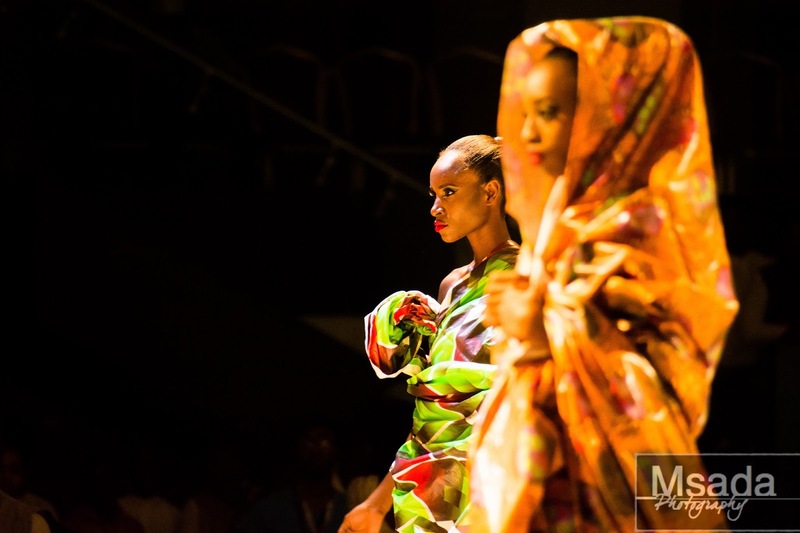 AFWL has hosted four catwalk events since inception in 2011 and contributed expertise to at least 10 more events produced by 3rd parties such as The Mayor of London’s Black History Month celebrations and the annual Africa Centre Summer Festival. We have showcased over 300 designers to almost 45,000 visitors including buyers, retailers and other industry professionals; and our open-to-the-public events are becoming a highlight on the annual fashion calendar. The Theme for AFWL 2015 is APPRENTICE & SKILL EMPOWERMENT". As part of our Youth Development Initiative for the Fashion Business industry, we will be nominating apprentices within the fashion industry that will be Tourism Ambassadors who will be mentored by different Fashion designers from all over the world for a rare opportunity to be on AFWL 2016 next year based on excellent performance index. On September 4th 2016, the 4th Annual Dallas International Fashion Showcase Presented by the City of Dallas and Trendy Africa Magazine will hold at the magnificent and historic Music Hall at Fair Park, Dallas. 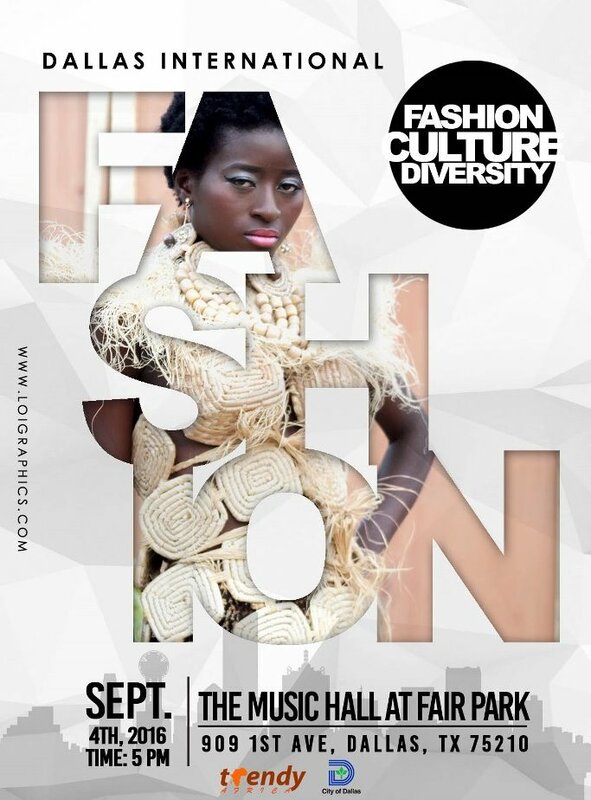 Dallas International Fashion Week is set to be the most DIVERSE yet with lot's of culturally exciting inputs. The historically glamorous Music Hall at Fair Park in Dallas, Texas will host up to 12 talented designers, more than 30 hot models and a host of presidential and diplomatic guests. It's time to make your reservation to attend and if you are a vendor; there is no better opportunity with the 3000 seat venue. Expect World Class Fashion, Music and Entertainment. More, including ticketing information can be found here. I arrived at the tents at Eko Marquee to fashion enthusiasts, photographers, exhibitors and the media. The rain didn't slow anything down on the green carpet set outside. I grab my press pass and head inside the tent to the show in progress. It was the first day, the show’s opening, and it delivered some heavy hitters. Designs mainly by the up and coming and students. I tell you, we have some talented folks in Nigeria. This year’s installment delivered as promised, there were a lot more designers rolled out in two days. As usual, I enjoyed it all—the pageantry, the models, the designers, the intricate fabrics of different colors, textures, styles, the ethnic inspired accessories with a with a modern twist, mingling with fellow industry professionals, meeting new faces, celebrities, fashionistas, collaborators. I got many compliments on my hair. 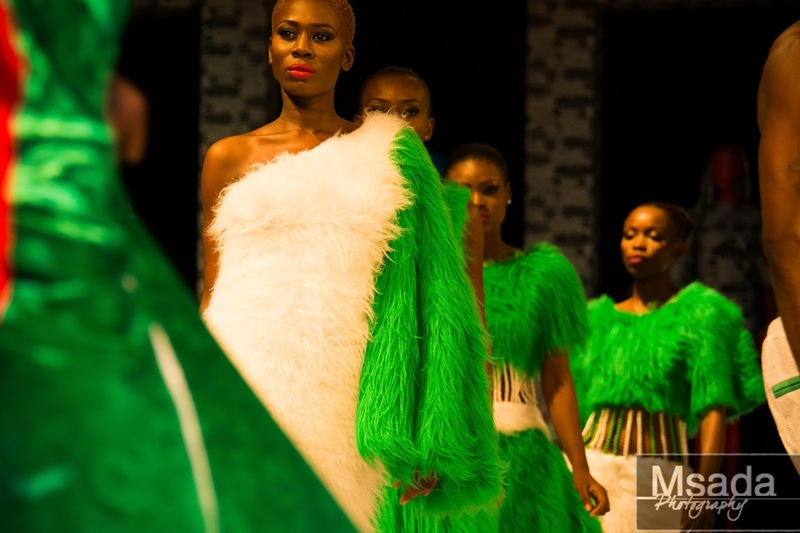 Nigeria have really come a long way in fashion, the designers were really on point this year, had me wondering who to patronize at the end of the show. I’m just glad that as time goes, African inspired fashion have gained a mainstay and international recognition. Day one delivered designers by the up and coming and students, namely Yaba Tech, FADAN, a Nigerian Student Fashion and Design Week winner. If the showcase was any indicator, I’d say the future is bright for these designers. Day two delivered more seasoned and well-known designers that have been making names for themselves and are recognized internationally, to include my good friend Adebayo Jones (more on him later). Designs ranged from haute couture to ready-to-wear, mens styles and children’s wear. There’s a little something for everyone and taste. There were artfully crafted evening dresses, cocktail dresses with cut-outs, thigh-high slits, long, short, asymmetrical hemlines, oversized, tailored suits, jackets, tops, pants and ethnic accessories, extensive bead work, sequins, patches, embroidery in delicate and durable fabrics and vibrant colors. It’s traditional-meets-modern, it’s afrocentric, it’s European, it’s regal, it’s edgy, it’s sophisticated, it’s classy, it’s a combination of things. Each piece is made to flatter and accentuate any curve and physique, the laces, silks and sequins just cascaded each model's body and bounced effortlessly, the fitted pieces were as if molded in place. The handbags and accessories are crafted using African textiles. Each is designed for today's man or woman, there’s hardly any design that’s not wearable. 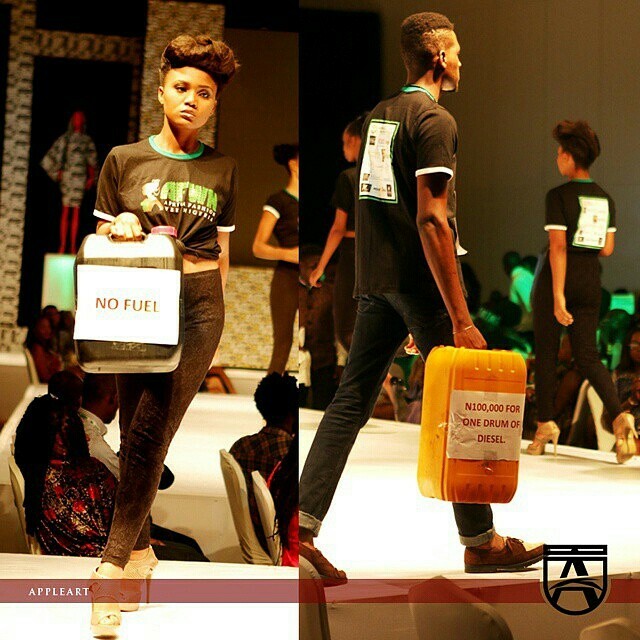 Event highlights include performance by child models for Tinnah Stylings by designer Toyin Lawani. They sashayed down the stage with swagger, to a rousing cheer by the audience, it’s like they were born for it! Amarachi—Nigeria’s got Talent winner and former alum led the procession, performing on stage. Although children’s clothes are hardly ever boring, this designer’s is especially fun. One would be excited to dress a kid up in the morning. JPKoutrue by Hadassah presented designs for full figured women with sass. Entertainment and flamboyant personality Denrele Edun didn’t fail to do what he does best—give the audience a dose of his big personality! I give it up to a guy who can rock high platformed heels like sneakers and big hair like mine. I loved his crochet braids. Notable actors Uti Nwachukwu and Ikechuchu Ogbonna walked for Big Ben Kilani collection. There was ample opportunity to catch the show as it was divided in three time slots, a 2pm, 5pm and 8pm. Day 1was a sensory overload as models kept sashaying down the runway in the packed tent until late in the evening. A day like this one is not without a few run-ins—with other photographers vying for prime real estate. A photographer has to double up as a hunter for great content, one has to be ruthless in the field, it’s a dog-eat-dog world out there. Any hesitation and you miss all the good shots, any misstep or shift and another has already taken your place. There are not many second chances for the money shot, no grace. My hair drew attention for right and wrong reasons. For the general audience mostly positive, for other photographers it’s was mostly in the way or a distraction. It all played out to my advantage really, I generated fans. Photographers (and the rest of the audience) all wanted pictures—of me! I was throughly spent by the end of the first day. I was reeling and expectant of what the finale show would bring—more heavy hitters. Attendees had the opportunity to catch the Pre Gala and the Gala Show. With my gear in tow, I stepped out in the late afternoon to the red carpet to members of the media and guests, the show's already started. They pull me aside for interviews on my personal style. I spend approx. 30 mins with a young protégé. My goal was to find the models backstage. I love to catch them out of their element, their different personalities during downtime. Backstage was organized chaos, everyone was everywhere. As a photographer, I'm always a little hesitant to get in a person's personal space. I thread softly, gaging body language, not everyone likes having their picture taken. As soon as they see me though they open up almost instantly. This was my chance to acquaint myself with all these human mannequins. "Oh yeah! I remember you from last year" some say to me. They're all smiles, posing as my lens flicker away. I catch the models, , makeup artists, other photographers, the designers. Everyone ever so curious about my hair. 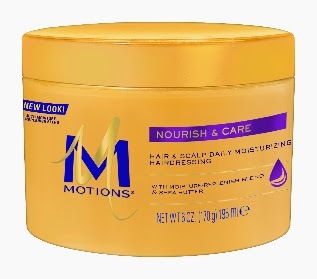 I laugh now as I recall these lines: "Is this all your hair?" “Can I touch it?” Apparently, Nigerians are not well acquainted with crochet braids—a hair trend that pretty much rescued women with natural hair. 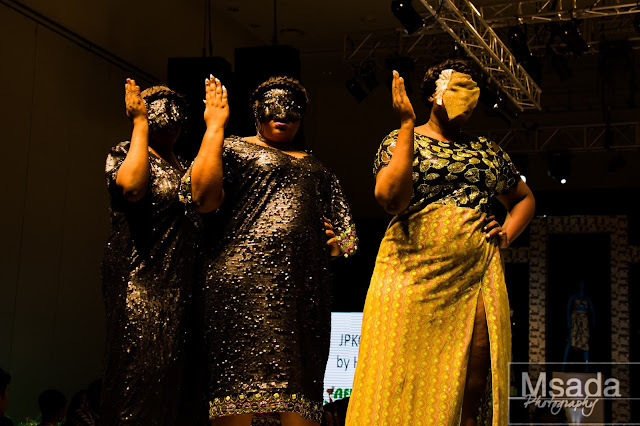 The venue at Eko hotels had been transformed into fashion wonderland, models sashayed late into the evening, coming to a head at the grand finale—the Gala Show. Cool FM’s Mercy Ajisafe and Mr. Nigeria 2014—Emmanuel Ikubese kept the audience entertained, dishing out awards and transitioning the audience through the program. Socialite, business mogul and fashionista—Ms. Abiola Okoya (more on her later) introduces a cause close to her heart. As the Global Ambassador for AFWN 2015 she’s on a fight for the eradication of Sickle Cell Anemia with Sickle Cell Foundation Nigeria. SCFN is making access to treatment more attainable, continues on research studies that would make SCA more or less a chronic illness than a death sentence. The disease she knows all too well as it hits close to home with two of her children. 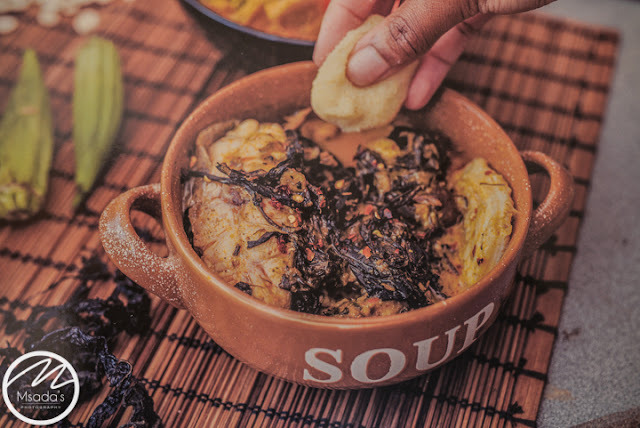 A global awareness for a disease that affect quite a population in Nigeria cannot be understated—150,000 reported cases annually, with countless healthy carriers of the gene [more info here]. I’m especially proud a platform such as this one is creating awareness for serious issues in Nigeria, to include the fuel scarcity currently suffered by it’s citizens, it was especially hard for some attendees who navigated the jungles of Lagos to obtain fuel to be able to attend this event. 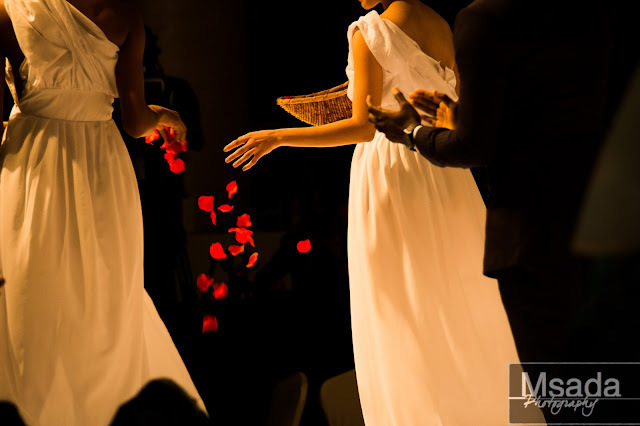 The Gala show produced exquisite designs by those that have perfected their craft overtime, notable is the King of Couture— Mr. Adebayo Jones, a London based designer, whose collection—Adebayo Jones Luxury, closed the show. He just commanded attention, his attention to detail is impeccable. His designs spell opulence, it’s luxury and regal with the use of chiffon, organzas, velvets, brocades, silks, damasks. I was blown away. It’s no surprise for a designer with more than 30 years in this business. 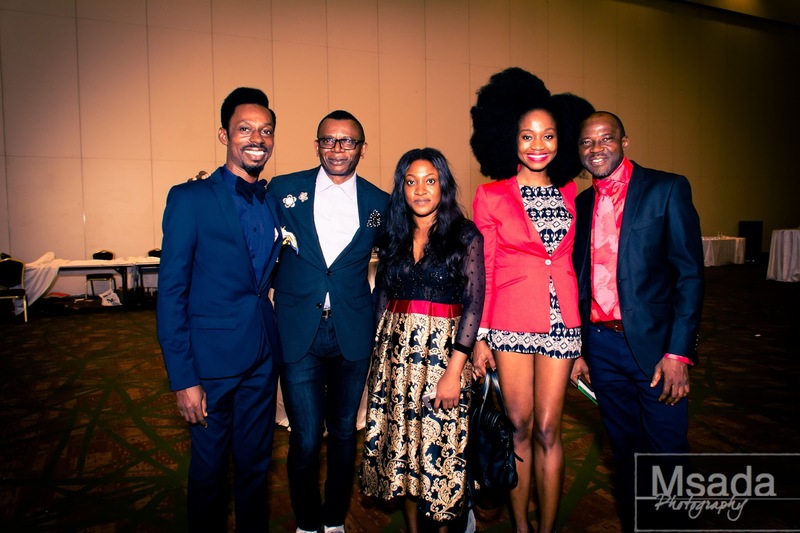 AFWN 2015 Style and Fashion Awardees include: Emerging Fashion designer McStell, Emerging Stylist Damilola Oke for Fierce & Modish, Emerging Fashion Journalist Antonia Soares for Complete Fashion, Most Stylish Female Celebrity Yemi Alade, Most Stylish Male Celebrity Kunle Afolayan, Young Fashion Entrepreneur Olakunbi Oyelese for April By Kunbi, Fashion Icon Opral Benson and Contribution to African Fashion Lexzy Mojo-Eyes. One lucky audience member with a business card won a round trip ticket to Africa Fashion Week London 2015, courtesy of Travelfix. Special thanks reserved to AFWN team Ronke Ademuliyi, Abiola Okoya, Abiola Olatunde Aloba, Yetty Ogunnubi, thank you for sharing your platform with me. I loved Yetty’s artsy-inspired collection, Revolution by Yetty D, filled with geometrics and color. All the wonderful people in the media and press or otherwise that I got to meet, Rich Tankley, Sonya Banjo, Shade Oladipo, the one and only African doll designer to compete with Barbie, Taofick Okoya (more on him later), the models (inbox me!). 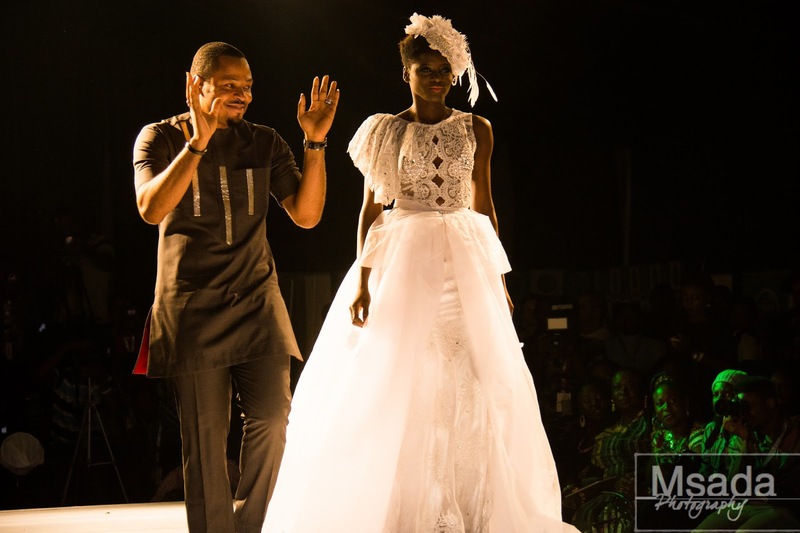 The master designer himself Adebayo Jones, next stop—definitely another one of your shows. It’s been a whirlwind and this article is long overdue. More pictures from AFWN 2015 on my Facebook page. 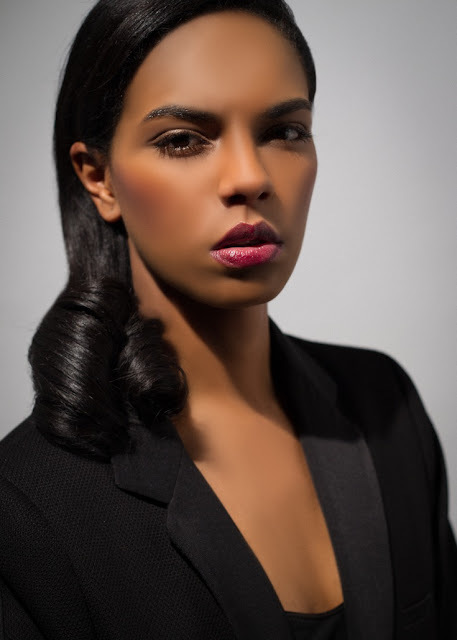 Noella Coursaris Musunka is an international model and the founder of Malaika. 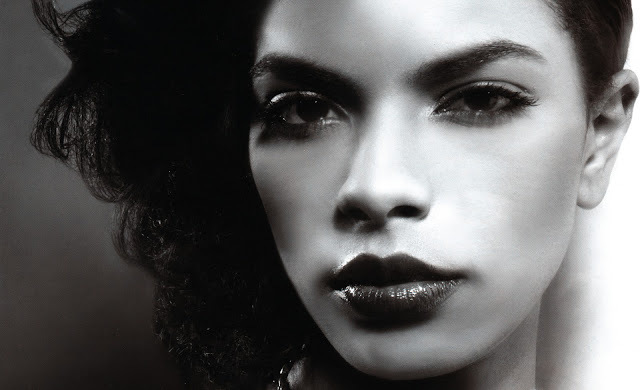 Noella was born in Lubumbashi, Democratic Republic of the Congo (DRC). The loss of her father at age 5, along with her mother’s lack of resources, led to her being sent to Switzerland to live with relatives. After achieving a degree in business management, she moved to London and began a career in modeling, where her first campaign was for Agent Provocateur. Her success brought her to New York where she has been featured in a myriad of publications, including Vanity Fair, Essence and GQ. 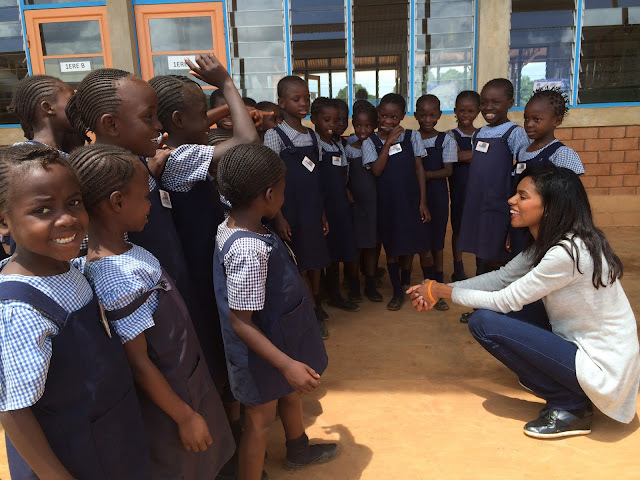 Alongside her active modeling career, Noella founded Malaika, a nonprofit that believes in empowering Congolese communities. 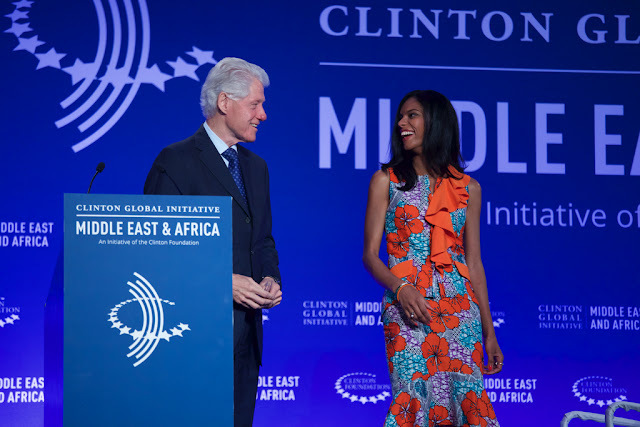 Malaika’s work in the village of Kalebuka impacts thousands of people through their multiple programmes - a free school for girls, a community centre built in partnership with FIFA, and five fresh-water wells. Fiercely proud of her heritage, Noella’s determination to help improve the lives of Africa’s youth has made her an international advocate for them. 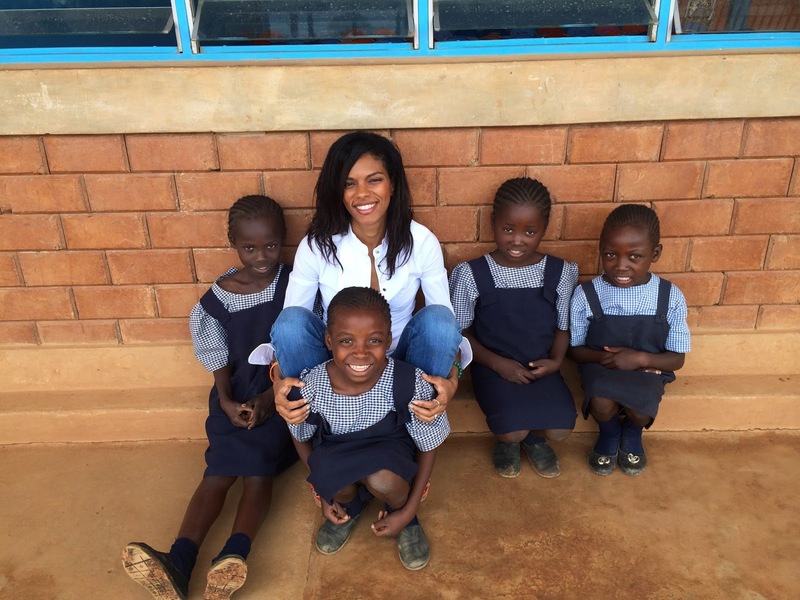 The success of Malaika has enabled Noella’s work to be known to a wider audience. She has been featured on Bloomberg TV, three different CNN programmes and the BBC’s Focus Africa. 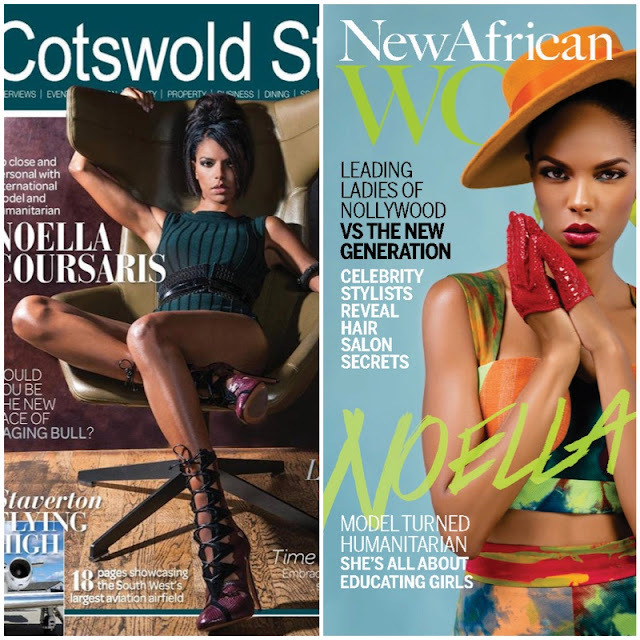 "We are so happy Noella is Brand Ambassador for AFWL 2015. She has been a great friend and supporter of our event and ethos over the years and a compassionate, hardworking, beautiful individual who understands our drive to showcase the best of Africa." 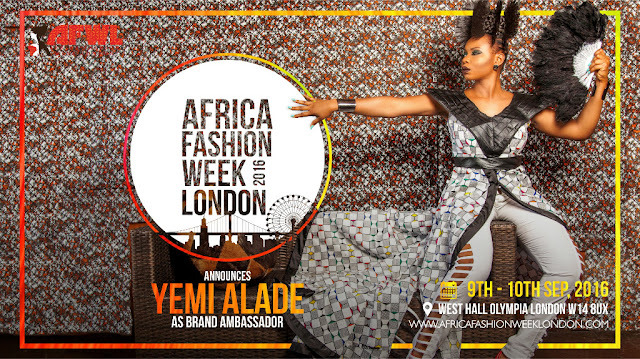 "I am delighted to be serving as this year’s Brand Ambassador to Africa Fashion Week London and to help showcase the brilliant work of African designers. It has always been my belief that fashion can be a tool for breaking down barriers and transcending cultures. This industry has the ability to put Africa on the world stage and can provide for countless job opportunities on the ground and abroad, from local factories to international shops. 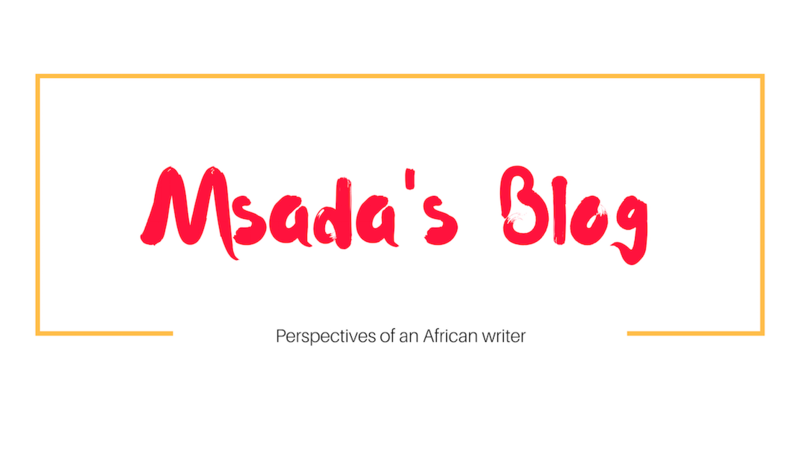 It is time for the world to see the amazing talent that lies within Africa." 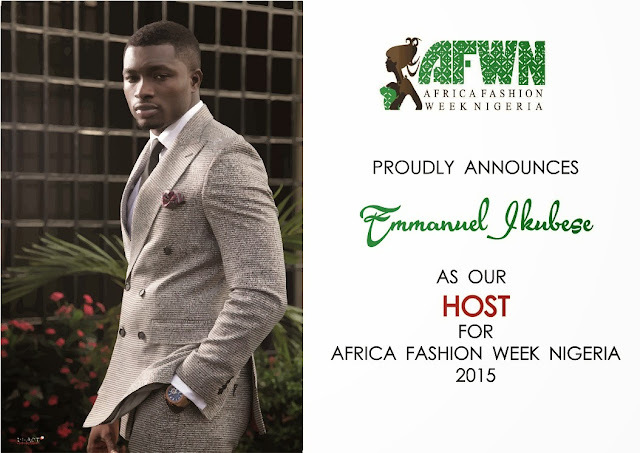 AFWL 2015 will be held at London Olympia, Hammersmith Road, Kensington, London W14 8UX on August 7-8 2015. Ticket information can be found here. 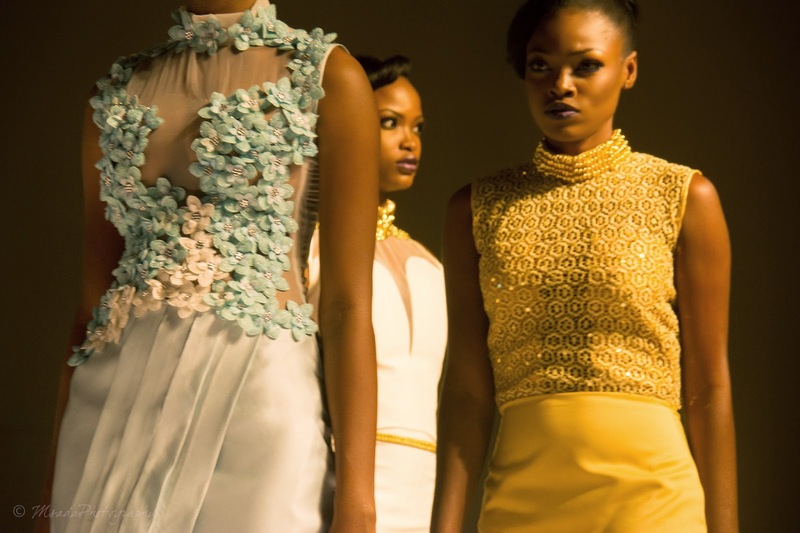 We are pleased to introduce to you Volume 2 of designers that will be showcasing at the Africa Fashion Week Nigeria. The event will hold at Eko Marquee on the 23rd of May 2015 and Eko Conventional Hall on the 24th of May 2015. The Eko Convention Hall will play host to the Pre Gala and Gala Show. Full Schedule for both days is now up on our WEBSITE. We are pleased to introduce to you, designers that will be showcasing at the Africa Fashion Week Nigeria. The event will be held at Eko Marquee on the 23rd of May 2015 and Eko Conventional Hall on the 24th of May 2015. The Eko Convention Hall will play host to the Pre Gala and Gala Show. Full Schedule for both days is now up on our WEBSITE. We have a number of pre events happening before the day which we will reveal to you soon. 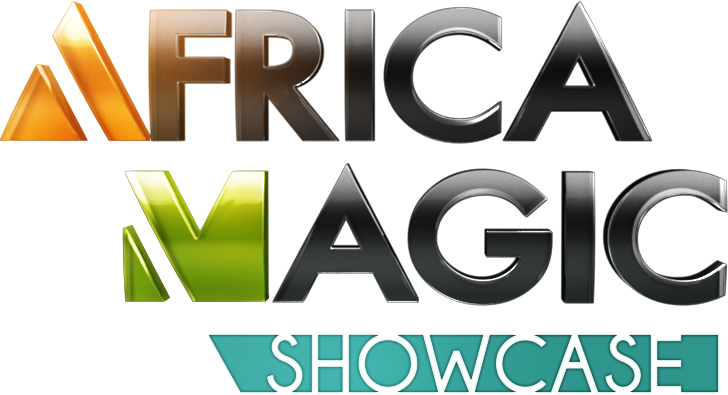 Africa Fashion Week, the leading platform for showcasing emerging and exciting fashion talent in the country, has announced Africa Magic as its Media Partner for the 2015 edition of the Fashion Week in Nigeria. The annual African Fashion Week Nigeria provides aspiring Nigerian designers with an opportunity to showcase their works to the continent and the rest of the world. 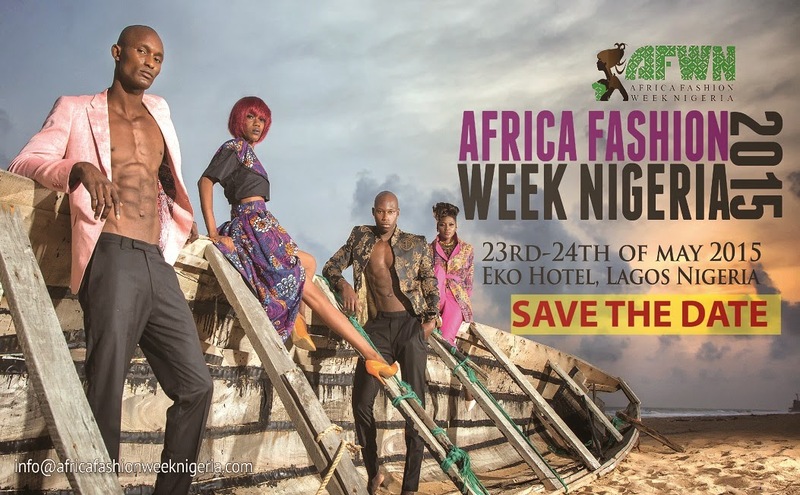 AFWN 2015 will take place on the 23rd and 24th of May 2015 at the Eko Hotel in Victoria Island, Lagos. 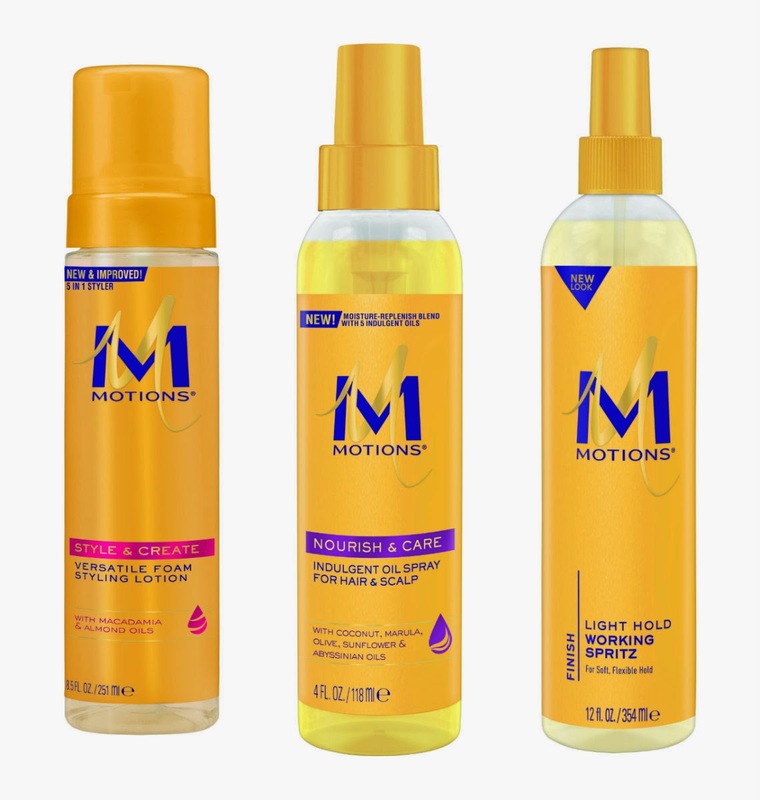 Leading hair care brand Motions have been announced, once again, as the official hair sponsors of Africa Fashion Week London 2015. The annual fashion event designed to showcase the best of contemporary African design takes place on 7 & 8th August at Olympia, London. 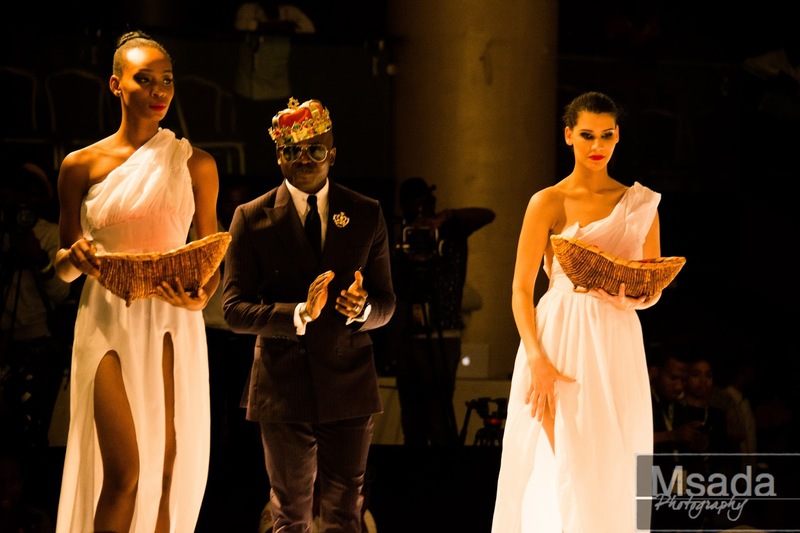 AFWN's goal is to showcase Nigeria's heritage through fashion. This year, we take a step back to fashionistas of our past to get a glimpse of how they lived. Through the years styles evolve but kinda remain the same (sort of). Let's just say we get our stylish gene from somewhere (wink!) AFWN will put up an exhibition on May 24th, Gala night that consists of images of fashionistas' best expression in Iro and Buba. Competition starts now, read on for a chance to enter. It's that time again! 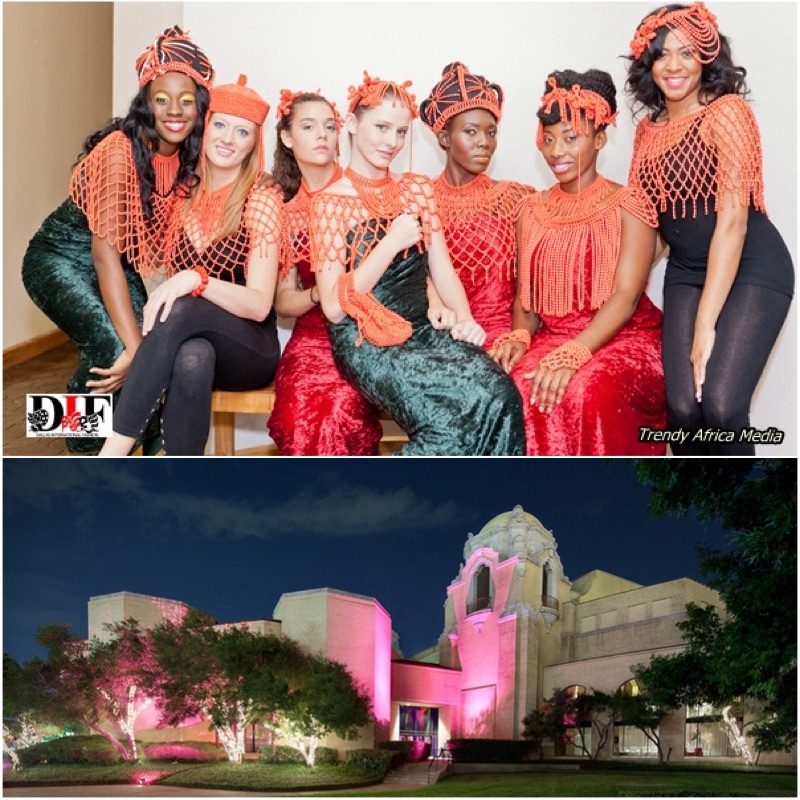 The third installment of African pageantry in Dallas. Dallas International Fashion Week will take place this May 14th thru the 16th, thanks to folks at Trendy Africa. True to its name, this year's show will attract investors and fashionistas from all over the world to the city of Dallas. 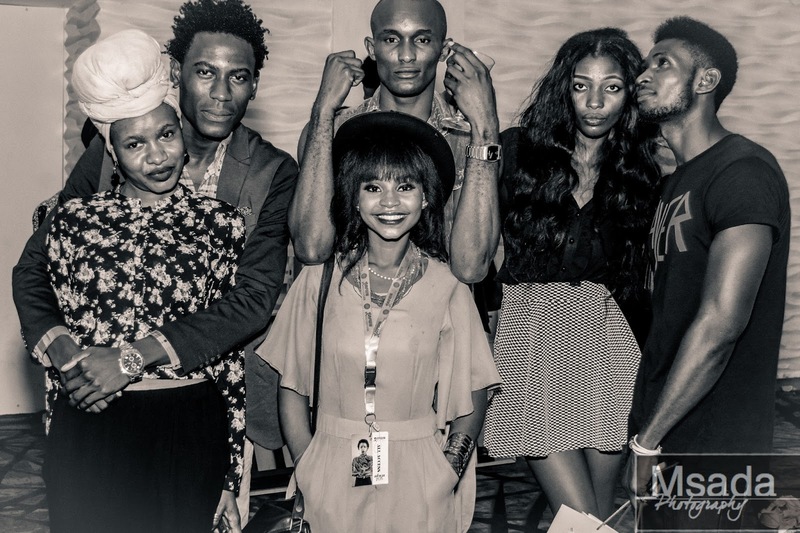 The platform of DIF creates awareness to African culture and the uniqueness of its fashion, fosters relations of African diaspora with the rest of the world. Attendees from past events can attest to its grandeur, this is a never-to-miss event, supported by the city of Dallas. 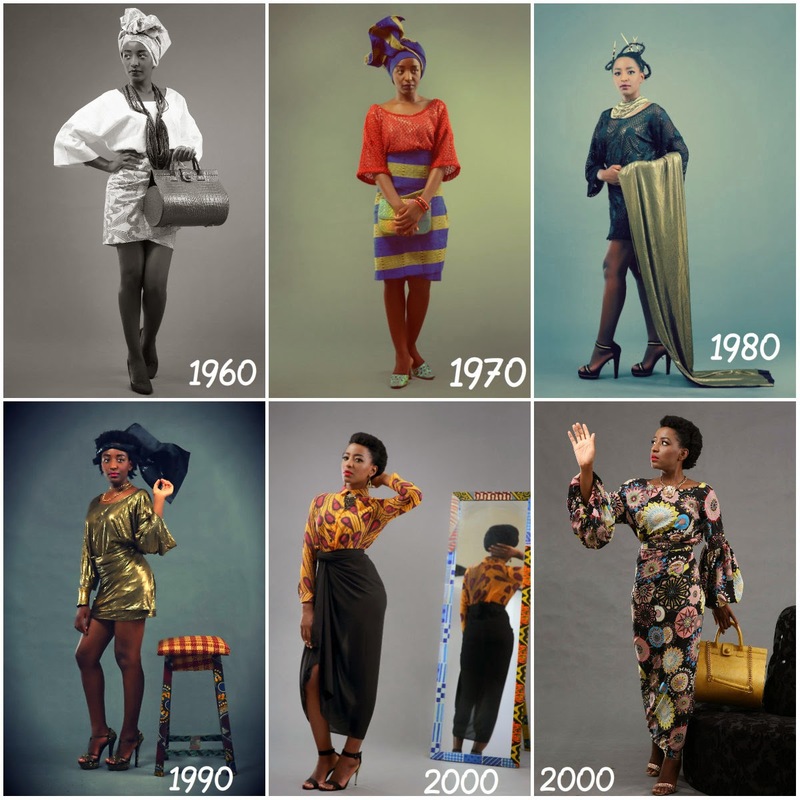 Designers of the past include Nollywood actress Ini Edo, Lucas Escalada, Kimma Wreh (more on her here) amongst others. More information on the event, sponsorship opportunities can be found here. Africa Fashion Week London is the biggest event in Europe with a focus on African and African inspired fashions, and Face of AFWL is the flagship competition, awarding the winner with the chance to work with and learn from industry professionals at this high-profile event. Maggie was the overwhelming favourite, chosen by the public on our social media platforms and takes over the mantle held by our lovely 2014 winner Chi-Chi Nwuba. 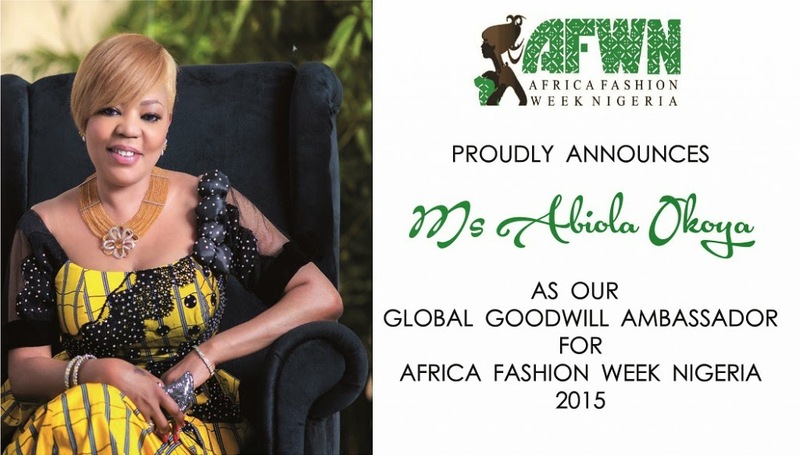 Ms. Abiola Okoya continues as the global goodwill ambassador for AFWN. Ms. Okoya can teach many women what it means to be stylish yet classy. Her aim is not just about fashion, Ms. Okoya is a passionate advocate for a cure for Sickle Cell Anemia. More on her here. January 30, 2015 at Amaris lounge in Lekki Phase 1, AFWN held an exclusive press and bloggers brunch to unravel what it's got up it's sleeve. This year's event is potentially big, expect bigger presentation with more notable designers on board. 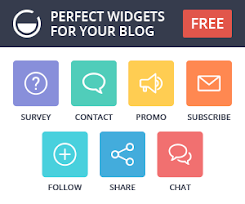 Noteworthy is the fact Nigeria is now supporting it's own. Right now, there's no better time to be part of a forward moving country, at least in the fashion sector. Lovers of fashion who want to be part of a cause are welcome. This event hosted numerous bloggers and members of the press. We all have our fingers crossed, can't wait for this year's event. Notable designers this year include Àsȧkéogé, Anuba couture, Lines by Chab, Ovemsfashion, Omaemihe, King Hakbal, Marco Martinez, Souza Fashions. Expect to see more showcase by emerging designers. AFRICA FASHION WEEK NIGERIA is a platform for African fashion designers to be appreciated and celebrated for the aim to display their creativity and originality to the global market. 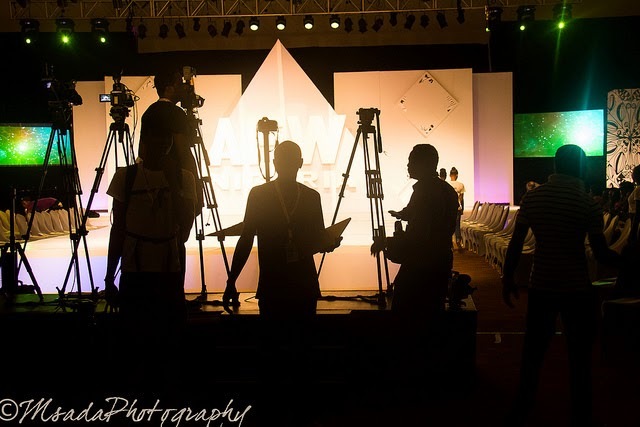 AFWN officially announces its second edition AFWN 2015 preparation and call for participation to all Nigerian and African designers who will be displaying alongside with various established African designers. 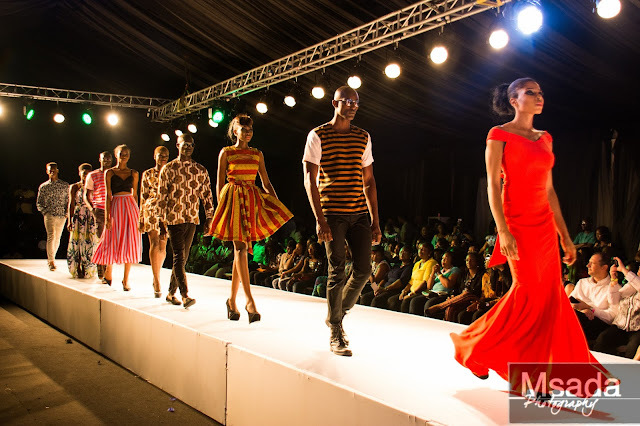 The 2015 AFRICA FASHION WEEK NIGERIA edition, will be having an open call to all student designers who will be hand-picked to showcase alongside established brands; as our own way of discovering, introducing new creative and innovative designers to add to the populating Africa industry. 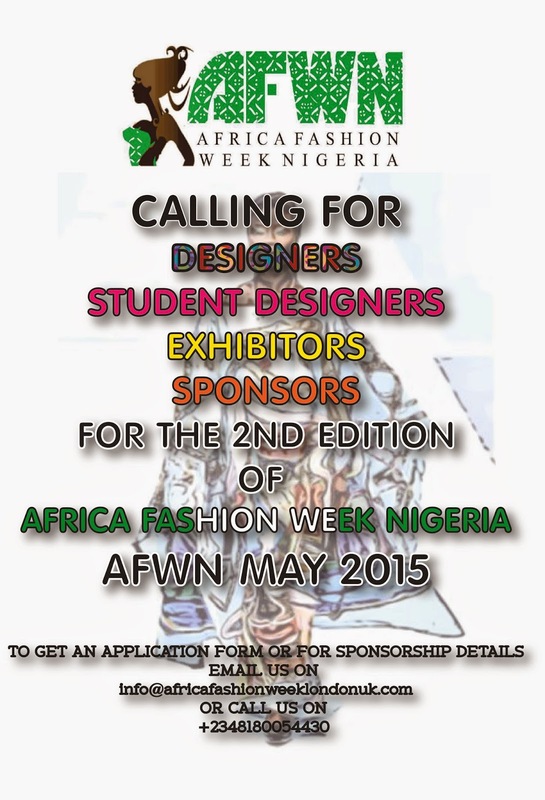 AFWN 2015, second edition is scheduled to commence in MAY 2015, Designer/ Exhibitor form is open for submission from December 2014 to 24th Feb 2015. Selected designers showcase will be fully or partly funded by our sponsors. 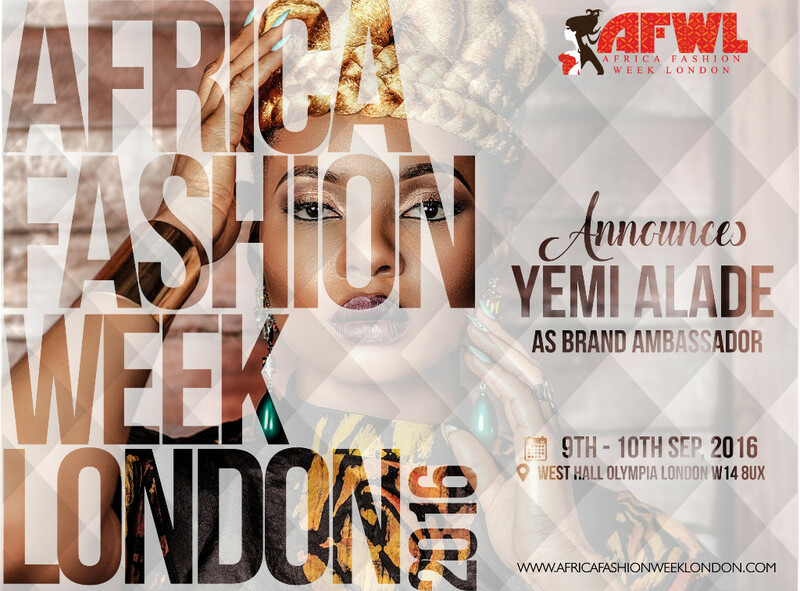 AFWN is organised by Africa Fashion Week London (AFWL) the biggest fashion festival in the UK & Europe for African inspired fashion and owners of the first African concession store on Oxford Street, London. Things are shaking up for this season, keep it here for updates. 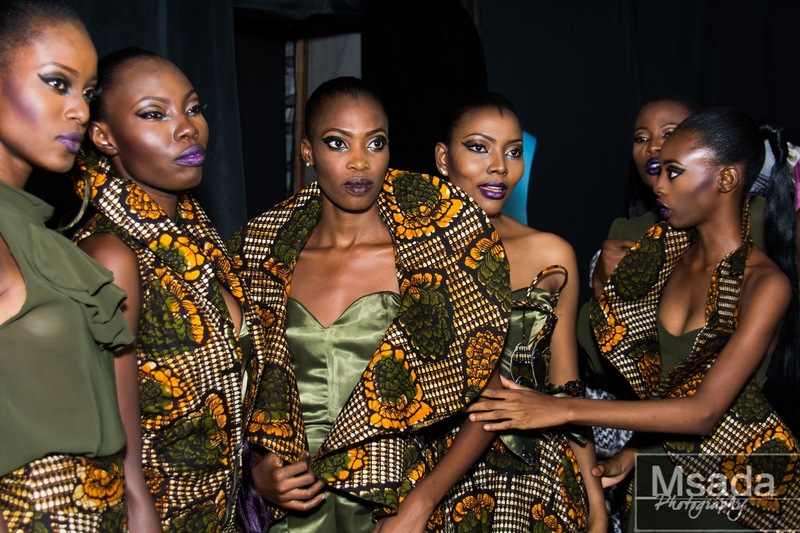 I had the privilege of working the runways of Houston Fashion Week, thanks to folks at Trendy Africa. This show is different for me because it's a conglomerate of designers and fashion lovers across a diverse spectrum, not just Africa, the models are very diverse too. It's high fashion, couture galore! These models are true glamazons. Strut strut strut...here they come! Flick flick and in seconds, they're gone! 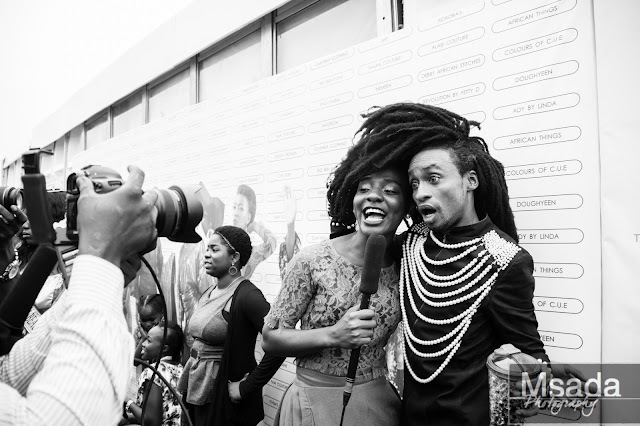 Just like a kid at the candy store, I found myself at this year's Africa Fashion Week in Nigeria. As usual for a fashion show, it's models galore; crew that included stylists, make-up artists, loads of lights, camera, oglers, and most importantly the people that keep it all going smoothly—the backstage manager and model coordinator. In my usual habit, I have a thing for lenses that flicker, especially my own. So as usual, my lens flickered while I quietly observed. One thing peculiar about models—they are consummate professionals in unflinching stances. It's easy to mistake them for mannequins as they're all dolled up like so. It's easy to forget: that's a human standing there, until one walks up to you in the restaurant while you're getting some lunch and says "Hi, I hope you're coming back?" And I say "Of course, I'm not going anywhere!" How do you yank a kid away from a candy store? New York, L.A, London, Paris, Milan and now...Lagos? That's right! The trailblazers in the motherland, Nigeria in particular, are making strides to put themselves on the map. This might be a third-world country, but it's hard to know that when great, talented and ever so creative individuals are breaking the mold.